Emotional Referral Zone 6 - Piedmont Physical Medicine & Rehabilitation, P.A. The sixth emotional referral zone is the energy center of intuition, intellect and reasoning. Known as the “third eye”, it involves our mental abilities and our psychological skill at evaluating our beliefs and attitudes. The sixth ERZ links us to our mental body, intelligence, and psychological characteristics. 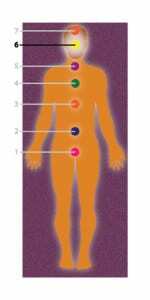 The combination of facts that we know or believe to be true, along with the fears, personal experiences, and memories that we carry within both our mental and physical body are integrated in the sixth ERZ. The sixth ERZ activates the lessons that lead us to wisdom. We achieve wisdom both through life experiences and by acquiring the discriminating perceptual ability of detachment. Symbolic sight is partly learned detachment; a state of mind beyond the influences of the “personal mind” that can lead to the power and insight of the “impersonal” mind. Continually search for the difference between truth and illusion, the two forces present at every moment. In becoming conscious one is able to detach from subjective perceptions, to see the truth or symbolic meaning in a situation and to trust what you cannot see far more than what you can see. Brain, nervous system, eyes, ears, nose, pineal gland, pituitary gland. Brain tumor, hemorrhage, stroke, neurological disturbances, blindness, deafness, full spinal difficulties, learning disabilities, seizures. Self-evaluation, truth, intellectual abilities, feelings of inadequacy, openness to the ideas of others, ability to learn from experience, emotional intelligence. Do you often interpret the actions of others in a negative way? If so, why? What negative patterns continually surface in your relationships with others? What attitudes do you have that disempower you? What beliefs do you continue to accept that you know are not true? Are you judgmental? If so, what situations or relationships bring out that tendency? Recall instances in which a more profound level of truth than you were used to hearing was revealed.